Weston & Sampson provides holistically integrated mechanical, electrical and plumbing (MEP) solutions. Our mechanical and electrical engineers and designers have a vast depth and diverse experience in all aspects of HVAC, mechanical, power, lighting, energy management and generation, and a myriad of other specialty systems. Our experience encompasses the full range of engineering, analysis, planning, and design of systems for both new and retrofit buildings and systems for a variety of facility types for both the public sector clients as well military, institutional, industrial, and hi-tech clients. Facility types include aquatics, commercial office, research and development, historic renovation, medical and electronic laboratories, private and public schools, higher education, manufacturing facilities, clean rooms, pump stations, water and wastewater treatment facilities, sports facilities, residential and retail complexes, data centers, and district heating and cooling systems. Weston & Sampson provides services for buildings and facilities of varying size and complexity. Our engineering staff stays with your project from concept development through production of contract documents and into construction field services. 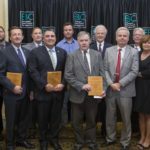 2016 EBC Nicholas Humber Environmental – Energy Award- The Environmental Business Council of New England (EBC) announced that Weston & Sampson is the recipient of the Nicholas Humber Environmental –Energy Award for Outstanding Collaboration, in recognition of outstanding public-private collaboration.